Every day computer keyboards are used in offices, factories, and homes around the world. 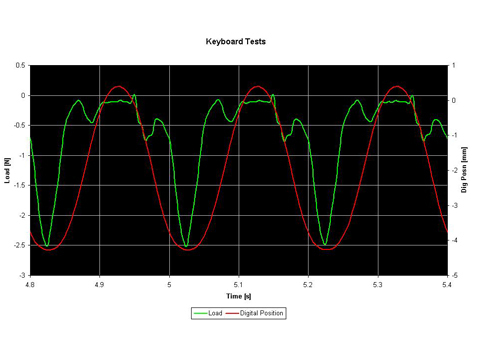 One of the biggest challenges faced by keyboard manufacturers is the long-term durability performance of keys that are subject to repetitive loading from typing. The objective of this dynamic test was to replicate normal finger presses of a key, from lifting off through to spring reaction through to full compression engagement of the key as it bottoms out. For this test, we used our ElectroPuls™ E1000 test instrument equipped with a low-capacity Dynacell™ and a simple compression platen to perform the test. 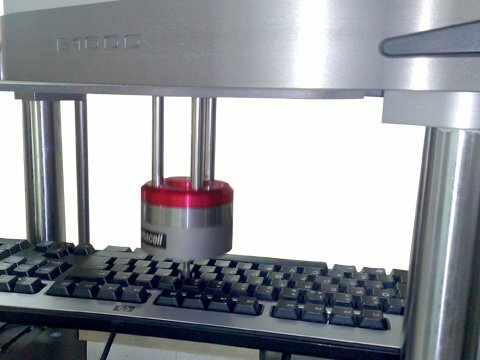 An off-the-shelf keyboard was selected and mounted to the t-slot table using two support blocks. With any component test, the load cell must be mounted to be upper moving actuator to provide accurate load measurement. Using the in-built features of the Dynacell load cell, automatic compensation was set up to overcome problems with inertial forces at very low loads. We manually jogged the actuator to establish the absolute position of the lift-off point, and we balanced the digital encoder. Using the default position gains, a sinusoidal waveform was run at 5 Hz in position control. Tri-Modal control was then implemented to provide outer loop control of the lower load peak of -2.5 N and a positive lift off in encoder control above the key. Position and load profiles where monitored during the test, and the load profile shows the full engagement, a spring-rebound and the lift-off phases.